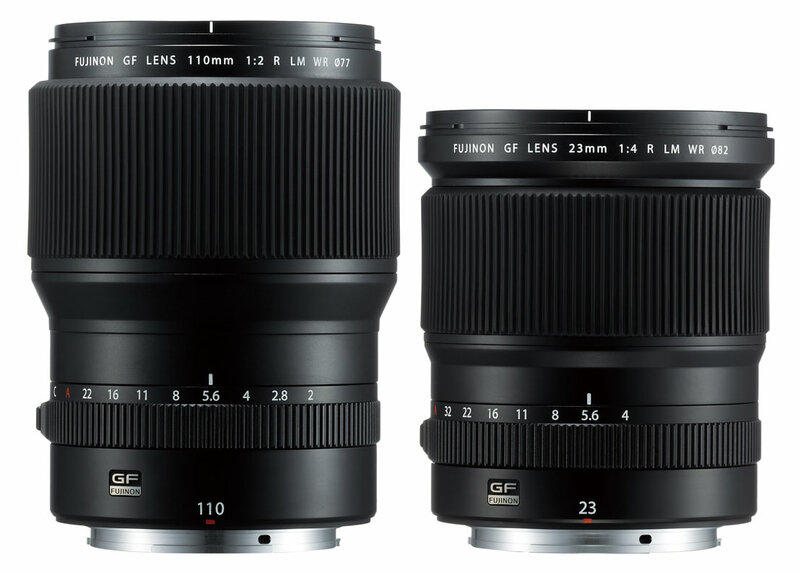 Fujifilm has announced full details of the new GF 110mm f/2 R LM WR and GF 23mm f/4 R LM WR lenses, including UK prices, plus new accessories. First shown at Photokina 2016, Fujifilm has released full details of the GF 23mm f/4 R LM WR and GF 110mm f/2 R LM WR lenses for the Fujifilm GFX system, along with additional accessories. The two lenses will be available in June with a UK RRP of £2399 for the GF 23mm f/4 R LM WR, and £2599 for the GF 110mm f/2 R LM WR. Accessories announced, includes a new EC-GFX - an eyecup for GFX 50S, and View Camera Adapter, which is due to be released in June 2017. Pricing details for the accessories has not yet been announced. Fujifilm is also showing an updated G Mount lens roadmap for 2017/2018. From Fujifilm: New GF lenses are unveiled for Portraits, Landscape and Architectural Photography, along with new accessories for the ground breaking GFX system. FUJIFILM Corporation (President: Kenji Sukeno) has today announced that it will release the FUJINON GF 110mm F2 R LM WR Lens and FUJINON GF 23mm F4 R LM WR Lens in June 2017. Both products are professional interchangeable lenses for GFX 50S 43.8×32.9mm format digital camera. Fujifilm has also unveiled new accessories to complement the GFX system. GF lenses achieve outstanding ultra-high resolution and have been designed to work with higher resolution sensors in the future. 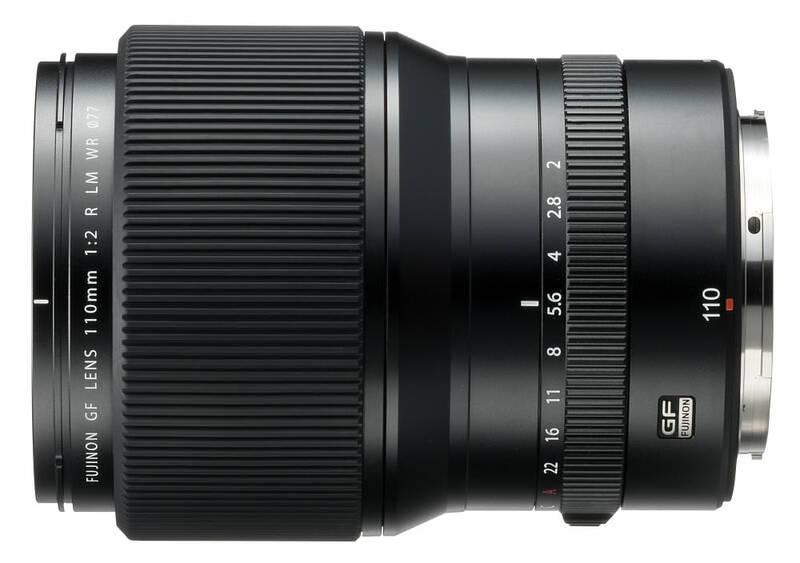 Utilizing the vast knowledge cultivated through the development of the XF lenses, GF lenses are Fujifilm's finest class of lenses and were designed by amassing various sophisticated technologies of Fujifilm. They are designed to fully unlock the superb performance potential of the GFX 50S. The FUJINON GF 110mm F2 R LM WR Lens is a medium telephoto lens for portraits. With a focal length equivalent to 87mm in the 35mm format, it achieves a brightness of F2.0 when used wide open to deliver beautiful bokeh. The high resolving power of the area in focus and the rich bokeh unique to medium-format fast-diameter lenses depicts portraits with a realistic three-dimensional feel. 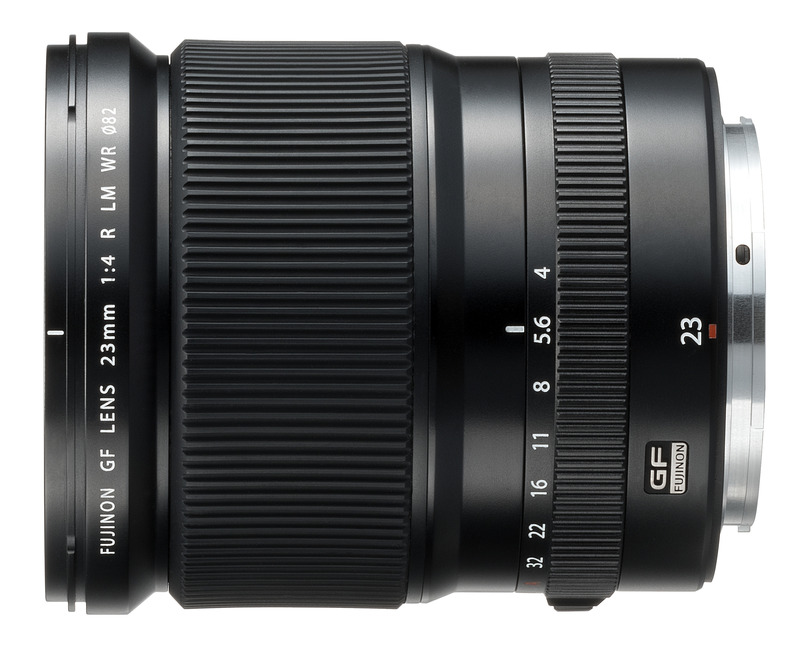 The FUJINON GF 23mm F4 R LM WR Lens has a focal length equivalent to 18mm in the 35mm format and is perfectly suited for landscape and architectural applications. Despite the super-wide angle of view, distortion is kept to a minimum, and with the high-resolution performance extending all the way to the edges, the resulting image is outstandingly sharp. Both lenses feature fast and quiet AF due to a linear motor, are dust and weather resistant, and are capable of operating in environments as cold as -10°C. The lenses combine high performance and reliability as professional work tools for the working photographer. High image quality - Using four ED lens elements, this high image quality lens limits chromatic aberrations by arranging the elements in a well-balanced manner before and after the aperture. By adopting an inner focusing AF system for the optimal configuration, aberration fluctuations due to changes in shooting distance are suppressed. Beautiful bokeh - By adopting a construction including 14 elements in 9 groups, including 4 ED lens elements, spherical aberrations and chromatic aberrations are suppressed. Nine rounded aperture blades create a beautiful bokeh at both the front and back which enables the rich expression of out of focus areas unique to medium-format lenses. Fast and quiet AF - A linear motor drives the autofocus, allowing for fast and quiet shooting using the AF. Dust and weather resistant - Capable of operating in environments as cold as -10° - The lens has been sealed in nine areas, allowing the user to shoot with stability even in dusty environments and in light rain outdoors. High operability - The aperture ring has a C position (command dial mode) that allows the lens aperture value to be changed via the command dial on the camera body to suit the photographer’s preference. A locking mechanism has been added to the A (Auto) and C positions to prevent unintended movements of the aperture dial. With a focal length equivalent to 18mm in the 35mm format, this super wide-angle lens is optimal for shooting landscapes and architectural photography. Low distortion with high resolving power - With a 12 groups and 15 elements construction using two aspherical lenses, one super ED lens, and three ED lenses, this lens suppress distortion despite being a super wide-angle lens with a 99.9° angle of view. Thanks to the optimal arrangement of the Super ED lens and three ED lenses, chromatic aberration of magnification is thoroughly suppressed, achieving high resolution performance all the way to the edge. Nano GI coating - Nano GI coating has been applied to the lens which targets incident light entering the lens from diagonal angles due to the nature of the super wide-angle lens. Despite being a super wide-angle lens, the occurrence of ghosting and flare is effectively suppressed. Fast and quiet AF - By adopting an inner focusing AF system to lighten the weight of the focus lens, and using a linear motor to drive the lens elements, fast and quiet AF is achieved, allowing for comfortable shooting. Dust and weather resistant - capable of operating in environments as cold as -10°C - The lens has been sealed in nine areas, allowing the user to shoot with confidence and stability, even in dusty environments or in light rain. High operability - The aperture ring has a C position (command dial mode) to allow lens aperture value to be changed via the command dial on the camera body. A locking mechanism has been added to the A (Auto) and C positions to prevent unintended movements of the aperture dial. A protective filter PRF-82 and front lens cap FLCP-82 will also be released. The new eyecup effectively shields light, making it easier and more comfortable for the photographer to see the viewfinder. The soft material also improves the fit for users shooting with the naked eye or with glasses. The new VIEW CAMERA ADAPTER G can be used when shooting with the GFX 50S when using older FUJINON large format camera lenses, such as the CM FUJINON, etc. The adapter is mounted in the film camera loading position of the view camera which adopts the film format of the 4x5 size.